So here's the story; about a year back I drove over some freshly laid tar without realising it. This was during a wet and muddy period and it was maybe a week before I washed my car and noticed what had happened. By then the tar was pretty much set behind the back wheels, and the usual places which get muddy. My car was barely six months old and I was very upset. Indeed. As you can imagine. I looked at various branded tar-removers all of which seemed quite noxious and I was rather wary of using those. Searched on the web and stumbled across WD40 as a tar-remover (really, I have no connection with that product) and as I had a can to hand I thought "....why not..." went outside and sprayed a tiny squirt on a bit of tar almost hidden underneath. It was astonishing - in seconds the tar started melting and dribbling off in a sort of brown gravy. I waited a few minute and then gently wiped the spot with a piece of paper and it all came off. I checked and felt to see if there was paint damage but apparently there was not. Thus emboldened, I took that can and sprayed liberally all over the tar and the effect was the same; tar started melting and easily wiped off. I then shampooed the car and waxed it - it's finish has remained perfect. The WD40 had taken everything off down the the paint - all the old wax too. So, my question is; has anyone ever considered using some of this stuff on a cloth, wiping it all over the car (it eats bugs as well as those irritating black dots which stick like crazy) instead of using a clay-bar, then washing and waxing? Are there those amongst you who would say (because you know) "Hey, don't do that.....!"? I'm really interested as clay-ing can be fun and the finish is excellent but it's a bit of a drag. 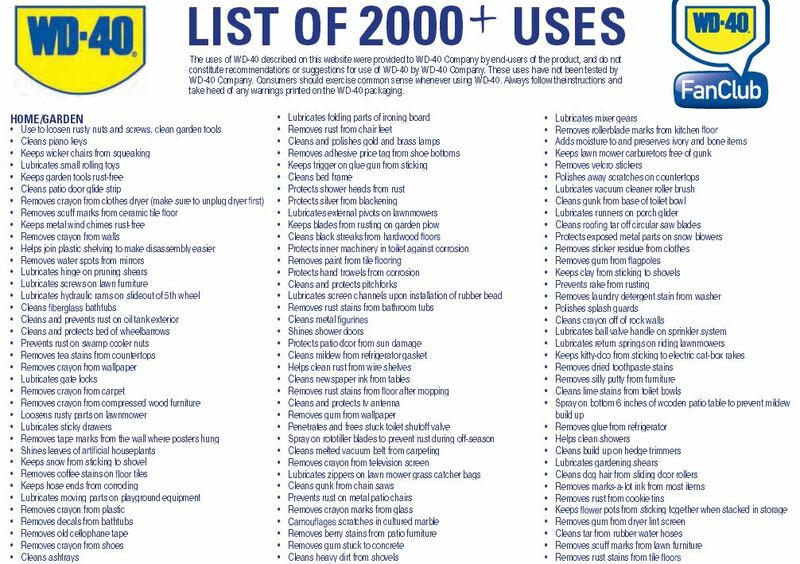 If you do a search, you will find a thread where WD40 is highly recommended as a leather treatment for your seats. One person also recommended it as an energy drink. Gilda: And just look at that shine! But will it last? Chevy: Hey, outlasts every other leading floor wax, 2 to 1. It's durable, and it's scuff-resistant. I'm in the leather business - you guys just gave me a mini-stroke. I'm waiting til next year for WD41. Sturgeon love it when a baited hook has a liberal application of WD40. They have been known to line up under the boat with mouths agape like baby birds waiting for a worm. That's not altogether surprising; I understand analysis of the (secret) components was inexact but did show fish oil as a constituent! Actually, WD-40 is made right here in San Diego. I've been to their manufacturing plant a number of times (it used to be one of my accounts). The oddest thing to me was that they add a scent concentrate, so that all batches smell the same. Mike, The listed page was just the first of many. I thought WD-40 is flammable and carcinogenic to human skin over long exposure???? Cuda911 won the thread, hands down! Heres another one: Great for dissolving seagull and pelican giant poop from the deck of my boat.